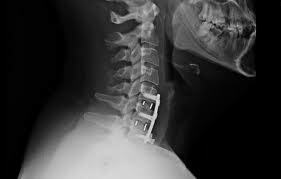 When you have neck (cervical) surgery, sometimes the surgeon elects to use instrumentation with plates and screws for fusion. It is not always successful, and sometimes it may be a real pain in the neck. Regenerative Medicine procedures such as Platelet Rich Plasma (PRP), Stem Cell Therapy, and Biologics may have a role in alleviating pain that persists in the neck. 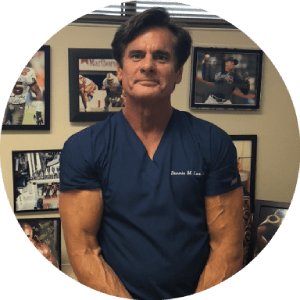 Sometimes with surgical procedures, the underlying cause of pain is not addressed adequately, or the pain generator is not where the fusion is. Many patients have multiple etiologies for chronic neck pain. Muscle pain is often overlooked, and thus untreated with surgery. Cervical or neck Fusion commonly results in accelerated arthritis above and below the cervical fusion site. Again, often more surgery is recommended. This can lead to stair stepping fusions up the spine. Platelet Rich Plasma (PRP) is a regenerative therapy that uses a concentrated blood sample of the patient to achieve a source of growth factors that may be used to address inflammatory cytokines, and provide a healing response by pro-anabolic cytokines. This may be a key component of arthritis propagation in the cervical spine (neck) as well as the entire spine. If pain generator sites are identified by a skilled experienced physician, such as Dr. Lox, a regenerative treatment plan may be implemented. PRP or Stem Cell Therapy can be used to treat select areas, if deemed to be actually causing pain. This assessment by a skilled physician, incorporates, a detailed history (listening to the patient), thorough physical examination, and at times, selective diagnostic blocks. Diagnostic blocks use small amounts of local anesthetics directly injected into a target, often under x-ray (fluoroscopic) guidance. If pain is relieved for a short period, then Regenerative procedures may be considered as a reasonable treatment approach. The approach differs mainly in the fact regenerative therapies such as PRP attempt to heal tissues, not mask or surgically alter tissues. Healing tissues is important to prevent or retard arthritis progression. By directly placing the PRP into the target area with fluoroscopic guidance, greater success can be achieved. Platelet Rich Plasma (PRP) has also been referred to as blood spinning. The patients blood is drawn, this is then centrifuged, concentrating the platelets. Platelets release growth factors which may exert a positive effect on the healing or reparative process. Many musculoskeletal conditions have been treated in such a fashion. Platelet Rich Plasma (PRP) and Stem Cell Therapy may be an alternative to neck surgery or having a screw in your neck.